The art of soldering-permanently joining metal components with a torch and solder-can open up a new world of creative possibilities for jewelry makers. 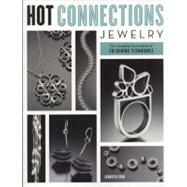 In Hot Connections Jewelry, award-winning jewelry designer Jennifer Chin guides you through every step, from choosing a torch to basic techniques like sawing, filing, and riveting, as well as more advanced techniques like creating surface textures, setting stones, and using inlay. With 23 in-depth lessons and 15 stunning projects, as well as inspiring examples from contributing artists, Hot Connections Jewelry is your essential guide to unleashing your creativity and confidence in jewelry making.